Talented, famous and everything going for him. Find out more on the St Andrews Chef Scott Davies who is now on the national television show – MaterChef: The Professionals. Scott Davies has been fortunate enough to get this far competing against some of the most talented chefs across the UK in order to get to the semi-finals. Passing Monica’s skills test before facing Michel Roux Jr’s classic challenges would be daunting enough however; Scott got through virtually unscathed- food stacking on a plate seemed to be the only negative remark made. Chefs were then asked to make a dish of their own, a difficult task as not all chefs impressed the fault finding critics. Scott served up a successful seared trout dish with pancetta, lentils, almonds, cockles, butternut squash puree and mussel sauce. His other dish went down a treat with his roasted loin of lamb with ravioli followed by a rum custard that had some kick. Only two competitors from six got through to the next stage showing how gruelling the process is. Afterwards Scott stated: “I honestly can’t believe it. It was always my goal that I would be really happy to get to the semi-finals…I’m absolutely ecstatic”. 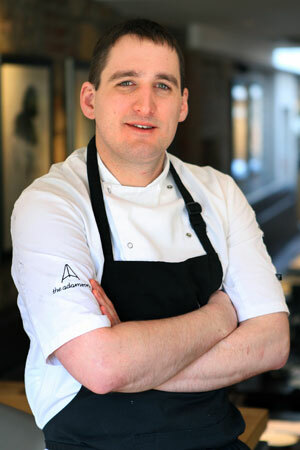 Scott Davies is the Head Chef at The Adamson and has been overwhelmed with the support provided from the restaurant and from the locals. Co-Owner of The Adamson Julie Lewis stated: “we are delighted as he’s a fabulous chef. Everyone here wants to see him do well and we will all have our fingers crossed for him”. Over the course of his career Scott has worked at several top Scottish restaurants, as well as spending a year in Melbourne, Australia. Having trained mainly in three rosette establishments, Scott successfully achieved his own three rosettes as a head chef at the age of 26. Scott believes a good working relationship with suppliers is key to sourcing the best Scottish produce and creating fresh seasonal dishes. He is delighted to be part of the Adamson team and to take part in MasterChef: The Professionals - lets wish him all the best! The old Post Office building is home to this latest gastro treat – The Adamson Brassiere and Bar in the ancient town of St Andrews. The Dalton family own and manage this culinary venture. The Menu has been created and inspired to offer diners a classic brassiere fare with a contemporary twist from steaks to moules frites, pasta and burgers. The Restaurant is open for Bruch and Dinner; the food complemented by a well-balanced wine list offers a broad selection of quality wines and a tantalizing range of cocktails as well as beers and spirits. The property has been thoughtfully converted with a stylish bar and restaurant and blends a comfortable décor with highly thought out fixtures to create a refined formality. The dining area with its wooden floors and exposed brickwork snakes right back to the open plan and visible kitchen which allows diners to see their food being prepared.